I LOVE bread. 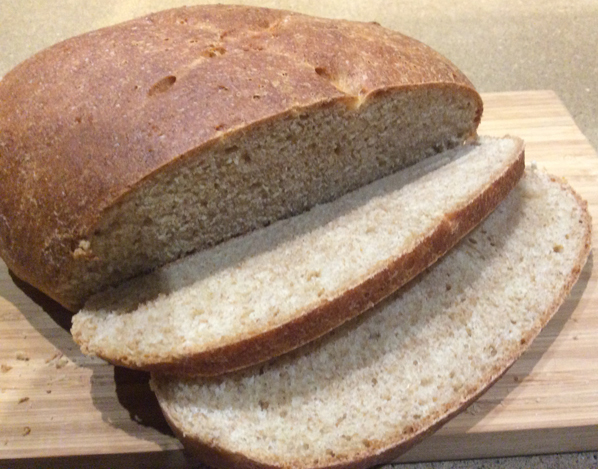 My husband challenged me to make a whole wheat bread that was as good as the one he gets at Great Harvest… challenge accepted. He ate 3 pieces with dinner. This is wonderful with just better and honey but would be great as sandwich bread. This is a no fuss, easy recipe. Adapted from a recipe in the “BreadmanTalking” blog from Jerusalem, Israel. 1. Mix the dry ingredients (the flours. sugar, salt and yeast) together in a large bowl or in the bowl of an electric mixer until evenly distributed. 2. Add the egg, oil and most of the water and mix to form a rough dough. Add water or flour to form a smooth, slightly sticky dough. Knead the dough in a mixer vigorously for about 10 minutes (or 15 minutes by hand), until the dough is very smooth and only slightly tacky. I mixed 10 minutes and then another 5 by hand adding extra flour as needed. 3. 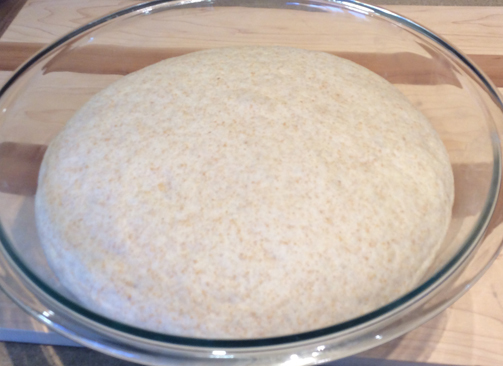 Place the kneaded dough into a lightly oiled bowl, turn to coat, then cover with plastic wrap to rise until doubled. This will take about 1 1/2 to 2 hours. (I put the dough in the warming drawer on the proof setting). Time will be less if using Rapid Rise yeast. 5. Start heating the oven 400 F about 30 minutes before baking. Just before baking, slash the bread twice or three times with a serrated knife, spray with a little water and place in the oven. 6. After about 15 minutes reduce the temperature to 350 degrees. Bake for a total of about 35 to 40 minutes. If you have a baking stone, you can move the boule from the baking sheet to the stone for the last 10 minutes of baking to give more crispiness to the crust.